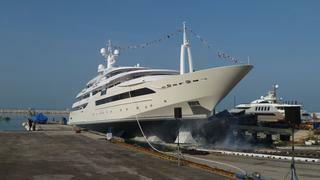 On Saturday Boat International watched CRN’s new 80m flagship Chopi Chopi splash down in Ancona, Italy – and had a sneak peek inside. The steel and aluminium displacement yacht is the largest ever launched by CRN, the Ferretti Group’s top-end superyacht brand, and its significance was underlined by the presence of Tan Xuguang, chairman of the Ferretti Group. Chairman Tan, whose Chinese conglomerate the SHIG-Weichai Group acquired a controlling interest in Ferretti almost exactly a year ago, said he felt ‘very emotional’ about the launch and was proud of CRN’s achievement. Ferruccio Rossi, Managing Director of the Ferretti group meanwhile, confirmed the company’s intention to tap into the burgeoning Asian superyacht market. While not yet finished, a tour revealed some impressive spaces designed for family life. From the full-beam main saloon a staircase leads aft and down to a garage for a Riva Iseo (the yacht carries two other tenders, a rescue boat and two jet skis) then a gym, sauna, and massage room for guests. Forward of the main saloon is a lobby, with an entrance starboard and glass lift to port. Forward again, a corridor comprises a series of family cabins – the wood and colour scheme of each chosen by the person who will use it. They include a cabin with fold-down balcony and a full-beam cabin forward, as well as an enormous study. Upstairs is a full-beam upper saloon – like the main saloon, this features a huge flat screen television – while aft is a lobby with a light-up onyx bar. This leads on to a full beam dining saloon with floor-to-ceiling windows on either side that open up to make the space feel very airy. Up again is the 270 square metre owner’s deck with a TV room, small guest/staff cabin, hairdressing room, massage room, forward owner’s cabin with 180 degree windows and an elaborate bathroom. In total the yacht offers 1,200 square metres of owner and guest areas for 12 guests (including owners) who will be attended by 33 crew and staff. Deck spaces are as generous as you'd expect for a yacht of this size, including a private terrace with a spa pool forward of the owner's suite and a sundeck with swimming pool. She has two Caterpillar 3516B-C engines offering 1640Kw at 1600 rpm. The top speed is expected to be 16 knots and cruising speed 15 knots, with a range of 6,000 nautical miles at 12 knots. Chopi Chopi will remain at the yard over the next few months for sea trials and fit out. Delivery is scheduled for May and her first cruise will be in the Adriatic sea.